In a gramophone shop in Istanbul, renowned record collector Christopher C. King uncovered some of the strangest—and most hypnotic—sounds he had ever heard. The 78s were immensely moving, seeming to tap into a primal well of emotion inaccessible through contemporary music. 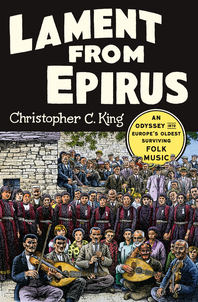 The songs, King learned, were from Epirus, an area straddling southern Albania and northwestern Greece and boasting a folk tradition extending back to the pre-Homeric era. To hear this music is to hear the past. Lament from Epirus is an unforgettable journey into a musical obsession, which traces a unique genre back to the roots of song itself. As King hunts for two long-lost virtuosos—one of whom may have committed a murder—he also tells the story of the Roma people who pioneered Epirotic folk music and their descendants who continue the tradition today. King discovers clues to his most profound questions about the function of music in the history of humanity: What is the relationship between music and language? Why do we organize sound as music? Is music superfluous, a mere form of entertainment, or could it be a tool for survival? King’s journey becomes an investigation into song and dance’s role as a means of spiritual healing—and what that may reveal about music’s evolutionary origins. “This engaging, well-researched, and peculiar book is not only a work of music criticism or a philosophical rumination on the meaning of music—it’s also a travelogue in which the writer goes native.